This Urban Farmhouse exterior mixes vertical and horizontal siding and is highlighted with metal roof accents and an exposed stone chimney. This house plan features multiple gables that create instant curb-appeal and a front entry garage works well for narrower lots. The gourmet kitchen features a large island and a bar with prep-sink that services the great room. A breakfast nook is available for casual meals while a separate dining room with buffet niche is great for entertaining. 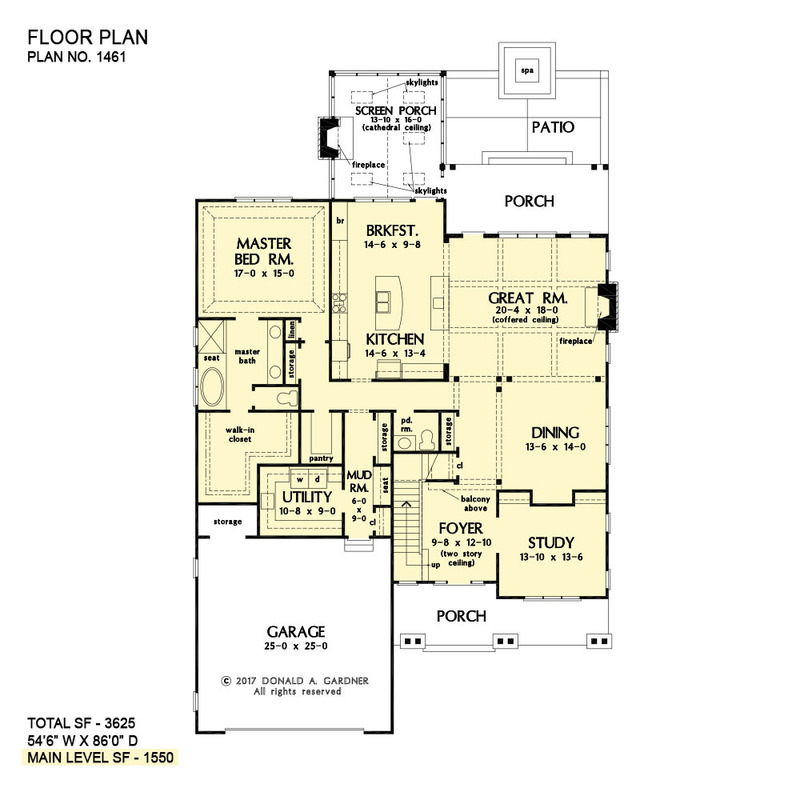 This floor plan meets every need with a powder room for guests, a walk-in pantry, spacious utility room, and a mud room with storage and bench seating. The master bedroom is topped with a tray ceiling and opens into a spa-quality bathroom and a walk-in closet with ample space for two wardrobes. The study completes the first floor and enjoys French doors and built-in shelves. Upstairs, three large bedrooms each have a walk-in closet. One of the bedrooms has a private full bathroom while the other two bedrooms share a bath with a double-sink vanity. 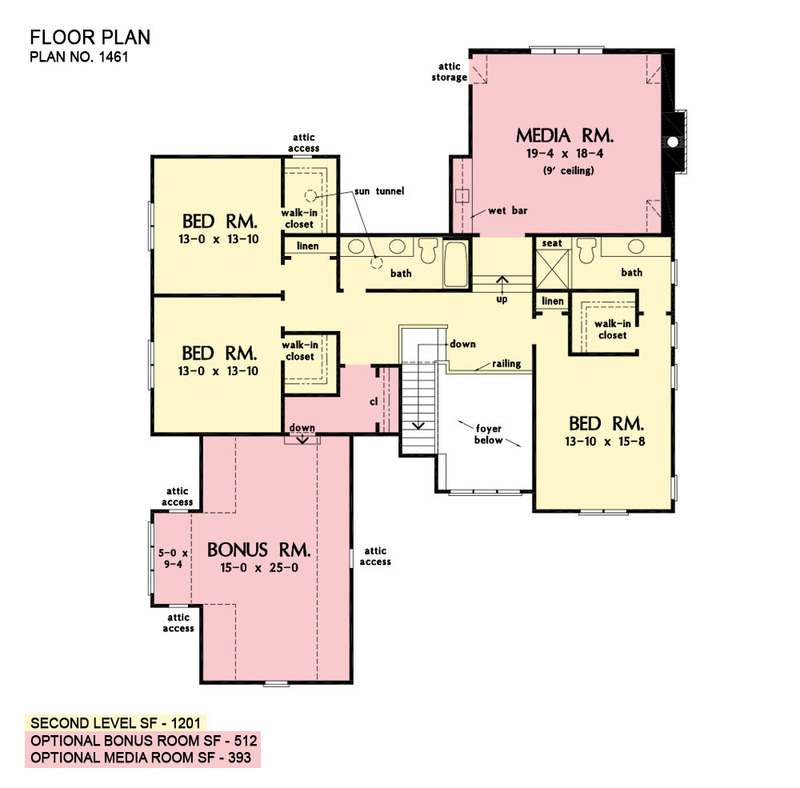 The bonus room could function as a guest suite or storage area and has its own closet. The second-floor media room makes the perfect space for games, movies or hobbies. 2nd Floor: 1201 Sq. Ft.
Opt Media Room: 393 Sq. Ft.
Porch - Front: 195 Sq. 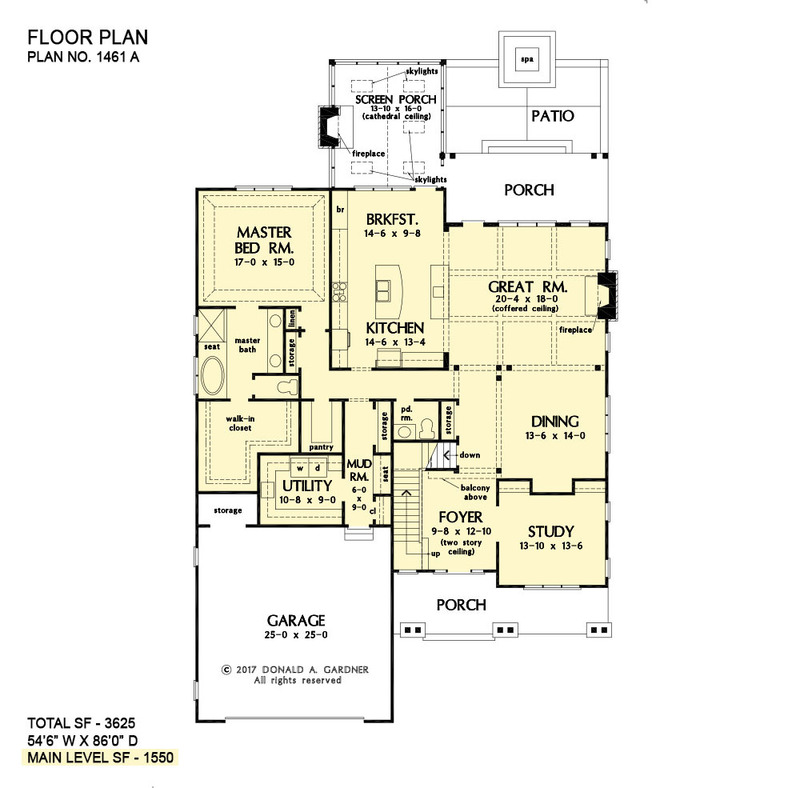 Ft.
Porch - Rear: 189 Sq. Ft.
Porch - Screened: 259 Sq. Ft.
House Dimensions: 54' 6" x 86' 0"
Great Room: 20' 4" x 18' 0"
Master Bedroom: 17' 0" x 15' 0"
Foyer (2 Story): 9' 8" x 12' 10" x 18' 1"
Dining Room (Flat): 13' 6" x 14' 0" x 9' 0"
Great Room (Coffered): 20' 4" x 18' 0" x 11' 0"
Kitchen (Flat): 14' 6" x 13' 4" x 9' 0"
Breakfast Room (Flat): 14' 6" x 9' 8" x 9' 0"
Utility Room (Flat): 10' 8" x 9' 0" x 9' 0"
Bonus Room (Clipped): 15' 0" x 25' 0" x 8' 11"
Garage (Flat): 25' 0" x 25' 0" x 0' 0"
Garage Storage (Flat): 7' 8" x 4' 0" x 0' 0"
Master Bedroom (Tray): 17' 0" x 15' 0" x 10' 6"
Bedroom #2 (Flat): 13' 10" x 15' 8" x 8' 0"
Bedroom #3 (Flat): 13' 0" x 13' 10" x 8' 0"
Bedroom #4 (Flat): 13' 0" x 13' 10" x 8' 0"
Porch - Front (Flat): 13' 4" x 8' 0" x 9' 0"
Porch - Rear (Flat): 21' 0" x 9' 0" x 9' 2"
Deck / Patio (None): 21' 0" x 12' 2" x 0' 0"
Porch - Screen (Cathedral): 13' 10" x 16' 0" x 17' 4"
Study (Flat): 13' 10" x 13' 6" x 9' 0"
Storage (1st Fl.) (Flat): 2' 0" x 5' 0" x 9' 0"
Storage (Other) (Flat): 2' 0" x 6' 8" x 9' 0"
Mud Room (Flat): 6' 0" x 9' 0" x 9' 0"
Media Room (Clipped): 19' 4" x 18' 4" x 9' 0"
Wet Bar (Flat): 2' 0" x 7' 8" x 9' 0"
Other (Flat): 1' 8" x 5' 4" x 9' 0"
Balcony (Flat): 8' 10" x 8' 4" x 8' 0"